Big and brash, Benidorm has an atmosphere that’s all its own. An always popular destination with Brits, this beach holiday destination offers miles of sands just minutes from shops, restaurants and bars, making it a top choice for an affordable, easy holiday..
With plenty of activities and Benidorm hotels aplenty on offer, holidays here suit just about everyone. With theme parks, water parks and adventure parks aplenty – families will be spoilt for something to do. Group holidays will have plenty to get to grips with when it comes to the boisterous Benidorm nightlife; and everyone will love the sunny temperatures, which soar to the mid-30s in June and July. 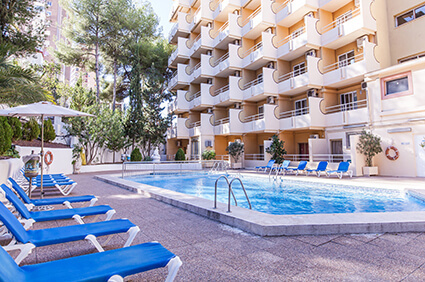 The incredible value of Benidorm hotels means that it’s always an attractive option for travellers on a budget. But that affordability doesn’t mean missing out. Benidorm is the original holiday resort and it knows how to cater to travellers. Easy access to beaches, restaurants, bars and shops wherever you are puts everything within walking distance. Couple that with a prime position on the Costa Blanca, and it makes for a holiday that goes at your pace, and all beneath the golden sun. And when that sun goes down Benidorm won’t disappoint. All-night bars and clubs offer an atmosphere that is pretension-free, fun-packed and utterly unforgettable. If that’s not quite your speed, the various shows, acts and tribute bands on across Benidorm every night offer a real treat. Benidorm has always unashamedly catered to a crowd that’s after a certain kind of holiday. And usually that doesn’t include experiencing the ‘real’ Spain. But if you are after a taste of something a little more authentic then Benidorm’s Old Town offers a reminder that this used to be a sleepy fishing village once upon a time. In fact, getting away from Benidorm itself can add some real variety to your holiday. Boat trips are regularly run, taking visitors to Peacock Island or Tabarca Island. As well as offering the chance to feel the sea-breeze and experience the Costa Blanca’s amazingly clear waters, these islands offer the chance to mix it up on your Benidorm holiday. Benidorm is nestled on Spain’s Mediterranean Coast in the province of Alicante. The majority of affordable flights head into Alicante Airport, which is only a 30 minute taxi journey from the centre of Benidorm. Benidorm was built up as a tourist resort focused around its beaches, and there’s a reason why. Even in peak season it’s well worth a visit to Playa de Levante, its clean sands and clear waters make it a stunning beach. In fact, it’s rated as one of Europe’s top sandy stretches. As well as the prime location to soak up the sun in Benidorm, Playa de Levante offers visitors easy access to a plethora of beach bars. Meaning your daytime fun can go into nightlife seamlessly. Poniente is where the sun sets in Benidorm. A quieter alternative to the Playa de Levante, things are a little slower here. The seafront promenade is a popular place for a stroll and the nearby Elche Park is great for resting under the palm trees if the midday sun gets too strong. For something cultural, head to the Bonfires of St John festival. It takes place on the 23rd June and features papier mache and wooden figures, which are displayed and then burned on the nit del foc. Head to the areas of La Cala, the Central Market, and the Old Town for the best ones. Low Festival has been running for over seven years, and is Benidorm’s biggest festival. It runs in late July, and there’s always a great line up. Previous acts have included Franz Ferdinand, Belle and Sebastian, The Kooks, and lots of local Spanish DJs. There’s great food, a huge pool, and enough room to relax and enjoy the music. If you’re looking for colour, look no further than Benidorm Gay Pride! Running every year in September, the whole of Benidorm lights in up a spectacle of neon, sequins and love. There’s a huge parade that starts on Playa Levante and snakes towards the Town Hall, after which there’s mass partying and live music. By far the most famous of Benidorm’s shows, the Benidorm Palace is all about Las Vegas style entertainment. Every night sees everything from dancers to magicians to big bands stepping up to the stage for an evening of colour, spectacle and glamour. Dinner and a show is a quintessential Benidorm experience in one of Europe’s best known venues. Located not far from Benidorm, Altea still retains a lot of its Spanish heritage. The real highlight though is the weekly market, where you’re unlikely to hear an English accent. It’s a place to pick up some souvenirs and to see a location that’s worlds away, but just 11km, from Benidorm. The marine animal centre is the perfect venue to bring along the kids. Chances are that they’ll find the dolphin show the highlight of their day – these twice-a-day shows can be viewed from the amphitheatre or from an underwater viewing port that gives a unique twist on events. And around the dolphin shows there are performances by sea lions, exotic birds and even roller-skating parrots. Away from the shows the animals live within areas closely mirroring their natural habitats, providing a holiday activity for your family that is memorable, mesmerising and educational. 100m from Mundomar is Aqualandia, and if you’re willing to make the lengthy journey it gives the kids the chance to get into the water themselves. Europe’s largest water park offers endless attractions that add to the waterpark experience. The Atlantic wave pool, Laguna springboards are perfect for the little ones, whereas the bigger kids will love the Kamikaze and Black Hole rides.